in operation at A&B Propane. Keep your old grill cooking like new! If your current gas company has grown too large to satisfy your independent needs, A&B Propane is the right choice for your Residential, Commercial, Industrial, Farming and Government needs. In business since 1974, we thrive on personalized service, giving you the best solution for your personal or business needs. 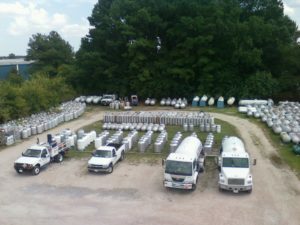 Located right here in Chesapeake, VA, A&B Propane is a family owned/family operated business that serves and supports a variety of customers within Southeastern Virginia and Northeastern North Carolina. We understand how frustrating it can be to deal with a gas company that seems distant and unconcerned. When you call A&B Propane, we’ll listen to your questions ~and~ we’ll ask our questions, to ensure we find the best solution for your individual situation. Our goal is to find the best solution for both the customer and the company. By doing so, we hope to create a proficient, long term relationship between You and A&B Propane. A&B Propane is a proud member of the Hampton Roads community. We support many local charities and organizations by making donations as well as supporting fundraisers which benefit our local community.